A new research report published by Transparency Market Research states that the global IT-enabled healthcare market will grow rapidly in the coming years due to the adoption of technology in the healthcare sector. The report, titled “IT-Enabled Healthcare Market - Global Industry Analysis, Size, Share, Growth, Trends and Forecast 2014 - 2020”, contains comprehensive research and analysis and has been compiled using primary and secondary data. According to the research report, the global IT-enabled healthcare market was valued at US$96.87 bn in 2013 and is expected to reach US$210.32 bn by 2020, registering a CAGR of 11.8% from 2014 to 2020. This growth will be a result of the growing eHealth programs, increasing government initiatives, and rising incidence of chronic conditions and diseases. However, the market also faces certain restraints such as issues with interoperability within various healthcare IT solutions and data security issues. 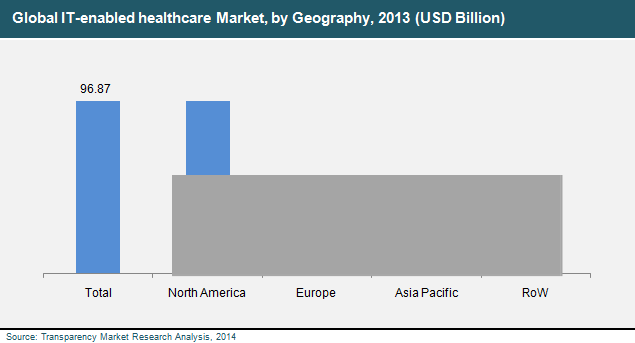 The global IT-enabled healthcare market is segmented on the basis of software, services, end users, and geography. The types of software used are healthcare system applications and mHealth applications. The healthcare system applications segment is further sub-segmented into administrative information systems (AIS), ancillary information systems (AIS), and clinical information systems (CIS). The CIS is further divided into electronic medical record (EMR), nursing information systems (NIS), computer aided diagnoses (CAD), and others such as medical imaging and surgery training. On the other hand, the AIS is divided into pharmacy information systems (PIS) and laboratory information systems (LIS). Depending on the services, the global IT-enabled healthcare market is segmented into tele-health, mHealth, and healthcare system strengthening solutions. The tele-health segment is further sub-segmented into healthcare diagnostics, remote patient monitoring, and healthcare education and others such as electronic prescribing software and online support. The mHealth segment offers solutions for patients such as information and reference services, diagnostic services, monitoring services, wellness services, treatment services, and prevention services. The healthcare system strengthening solutions segment is divided into emergency response services, healthcare practitioner support, and healthcare surveillance. The end users in the global IT-enabled healthcare market are public and private healthcare institutions, healthcare workers, individuals, and physicians. Geographically, this market is spread over regions such as Asia Pacific, Europe, North America, and Rest of the World. As of 2013, IT-enabled healthcare software segment held a share of 74% in the global IT-enabled healthcare market by product type. On the other hand in the same year, the tele-health segment dominated the global IT-enabled healthcare market by services with a whopping share of 77%. Amongst the end users the private/public healthcare institutions segment held a massive chunk of 51% in the global IT-enabled healthcare market as of 2013. In terms of geography, North America will continue its dominance due to a growing pool of geriatrics and quick adoption of eHealth solutions. Some of the important players in the global IT-enabled healthcare market are Cerner Corporation, McKesson Corporation, Koninklijke Philips N.V., Allscripts Healthcare Solutions Inc., eHealth Technologies, GE Healthcare, Siemens AG, IMS Health Holdings Inc., E*HealthLine.Com Inc., AirStrip Technologies LP, Aerotel Medical Systems Ltd., Johnson & Johnson Healthcare Systems Inc., AT&T Inc. and Apple Inc.